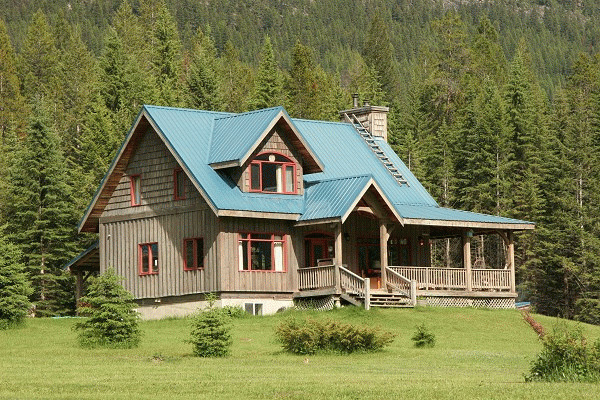 Nipika Mountain Resort is nestled in the Canadian Rockies beside Kootenay National Park and offers guests a recreational and leisure environment situated right out the front door of our luxurious lodge and cabin accommodations. Nipika accommodations, as an environmentally friendly eco lodge, invite guests to retreat, relax and have fun. Cross-country ski, mountain bike, hike or run on our endless trails out the front door. Fish, canoe, kayak or raft the nearby Kootenay River. 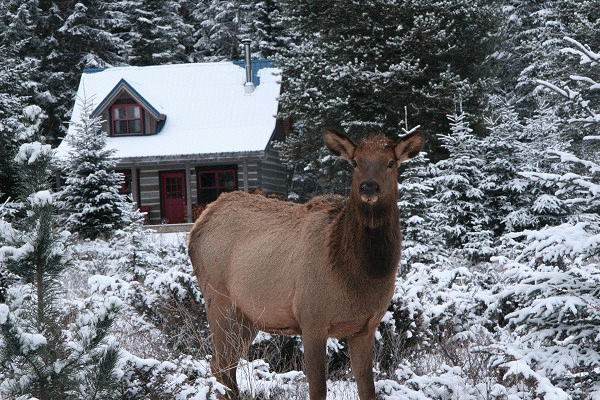 Or just sit on the porch and watch wildlife graze on the meadow. As an eco lodge, Nipika generates all of its electricity via solar, micro-hydro, and takes pride that its beautiful cabins and lodge are energy self-sufficient. Nipika is also a working woodlot. You may observe the horse logging operation while out on the trails. 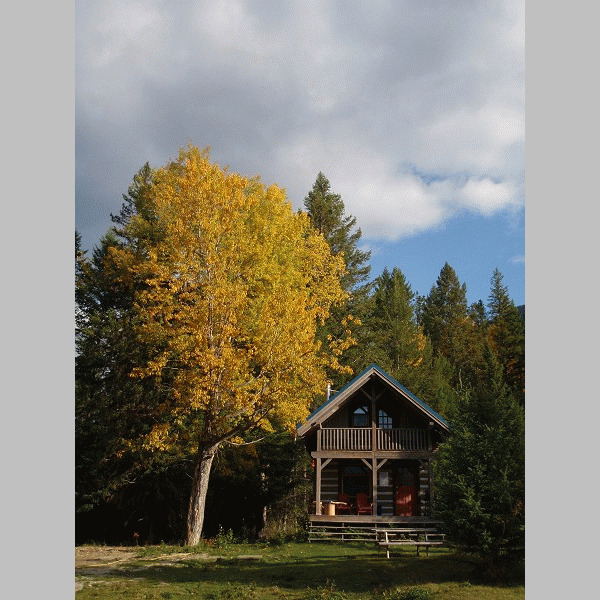 The cabins at Nipika are constructed from woodlot trees killed by mountain pine beetles, which were milled and notched onsite. Much of our beautiful wood furniture grew on site and was produced right in our woodworking shop. Through sound and selective forestry practices, it is Nipika's goal to enhance the wildlife and recreational values of the area. There is a natural emphasis on self-propelled recreation at Nipika. With its 50-kilometre trail network and rivers nearby, the resort beckons visitors to hike, cross country ski, snowshoe, mountain bike, canoe and kayak. Nipika offers a great get away for weddings, reunions, and other group gatherings, including offering a series of activities for all outdoor enthusiasts including guided hikes, ski lessons, river tours and more for Nipika guests as well as day visitors. 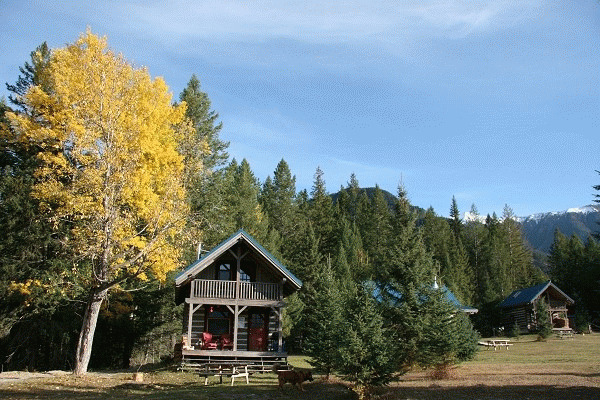 We are located at 9200 Settlers Road between Radium Hot Springs, B.C. and Banff, Alberta in the Canadian Rocky Mountains. Nipika is an eco-resort, and generates all its electricity utilizing green technologies and takes pride that its beautiful cabins are energy self-sufficient. There is an emphasis on self-propelled recreation at Nipika. With its 80-kilometre trail network and rivers nearby, the rocky mountain resort beckons visitors to hike, cross country ski, snowshoe, mountain bike, trail run, canoe and kayak. Nipika has a colourful past. The history of this rocky mountain accommodation predates written history. The Ktunaxa people have occupied this region for literally thousands of years, travelling the great Kootenay River hunting and fishing. The title was created after World War I and trapper Bill Yearling got the title of this Rocky Mountain wilderness from Her Majesty the Queen. Yearling Creek, which flows through the meadow, is named after Bill Yearling. Yearling spent five years in the Kootenay Mountains, trapping and hunting until 1925, when he sold the land to a German immigrant, Frank Richter. The original Bill Yearling Interpretive cabin is still standing in its restored state on the North side of the meadow. Nipika is set amid a massive 100 kilometer scenic trail network built and maintained for cross country skiing, mountain biking, hiking and trail running. The trails are set along the beautiful Kootenay and Cross River valleys, with many scenic vistas, waterfalls and wildlife viewing opportunities. 50 kms of ski trails are groomed for both classic & skate skiing, while an additional 50 kms of trail offer some of the gnarliest and most scenic single track anywhere. The spectacular Natural Bridge and Cross River canyon falls are landmarks which must be seen while enjoying the trails. The Cross River Canyon Trails are operated by Nipika Rocky Mountain Resort in partnership with the BC Ministry of Forest, Lands and Natural Resource Operations. The Cross River Canyon Recreation Site spans across 1500 acres and is designated as a non-motorized/ non-shooting Recreation Site specifically for skiers, snowshoers, cyclists, hikers and runners. Whitewater Rafting - Raft 1/2 or full days down the wild & scenic Kootenay River. Nipika in conjunction with Kootenay River Runners offers daily whitewater rafting trips on the Kootenay River, leaving right from your doorstep at Nipika. Nipika Mountain Resort offers outdoor enthusiasts tranquil luxury in the spectacular natural setting of the Canadian Rockies. A Kootenay resort nestled in the majestic rocky mountains. 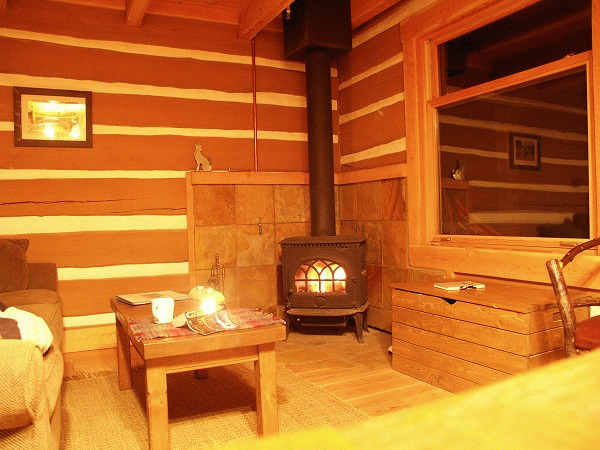 Our non-smoking Canadian Rockies Cabin accommodations are well appointed with complete full kitchen and bathroom amenities, fireplaces, barbeques and plenty of comfort and privacy. Kids are welcome, and Nipika is proud to be a pet friendly resort as well! Internet and a satellite phone are available - but your cell phone won't work at Nipika. Nipika's Day Lodge & Conference Center offers a unique and picturesque venue for banquets, parties and conferences with full catering and meeting amenities for groups of up to 100 people. Weddings - Exchange vows in Canada's most spectacular Rocky Mountain retreat, a perfect spot to start your honeymoon. Ask for our detailed Wedding Packages information. You can book the entire Resort and have exclusive use of Nipika for your special event. Nipika also has a wood-fired hot tub and sauna to ease aching muscles or relax work-weary heads. The pond is a popular place in both winter (for ice skating) and summer (for a refreshing dip). Please visit Nipika Mountain Resort Website.